I was having one of those “ain’t it awful?” conversations with an old friend the other day who is a big advocate of economic justice issues. Editors’ Note: In getting grounded in the media landscape we talked with Robert McChesney, an activist scholar in the area of media policy and founder of Free Press (www.freepress.net). McChesney’s description of the active approach toward publications and the press throughout U.S. history can inform and inspire us to shift ourmedia environment to one which is more relevant for an informed democracy. Is a nonprofit sector doing all it can to address the disaster wrought by the recent hurricanes? Nonprofits have a role and responsibility in ensuring that the nation’s response to Hurricane Katrina amounts to more than profit taking for the well-positioned. For nonprofits with open eyes and motivation for change, hiring a fund development consultant can pay off in a big way. 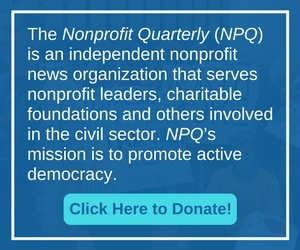 This is the first installment of NPQ’s longest running column, the Nonprofit Ethicist. What is your dilemma? Advice in this column includes the Ethicist’s take on an MSO’s board issues, and what to do with a bad case of founder syndrome. Nonprofits are using information and communications technologies to support their missions in innovative ways. Many of these organizations are achieving great results with limited amounts of money and technical expertise. Welcome to the fall 2005 issue of the Nonprofit Quarterly entitled “Amplifying Democracy: Nonprofits and Communications.” Inside, we have included articles on everything from branding and social marketing to how communications fits in social change and organizing strategies. We have looked at how communities can be helped to reframe issues and what it takes to tell a good enough story to impact public policy. There is a wealth of information in these pages, in fact, and more links to information that we were not able to include. By way of introduction, we would like to call your attention to some foundational concepts. First, there is a natural link between a free press that promotes discourse and dissent, and a sector that promotes citizen engagement on social issues. To move an issue from being a concern of the already convinced to being a concern of a broader community, we need to cultivate that broader community.